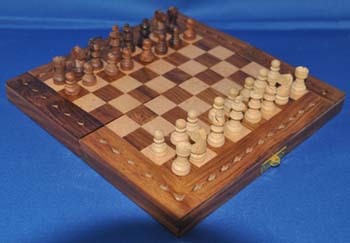 Chess has been hailed as the greatest of games, being a challenge for all level of players. It was included in numerous Hoyle's Rules of Games as well as boys' activities books. 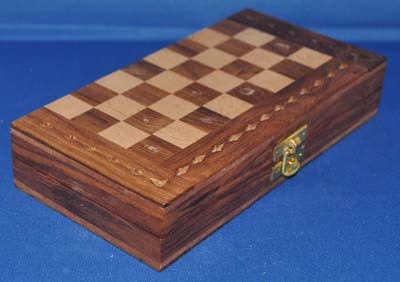 This set has a border of wood on the bottom that, when the board is folded, forms a closed cavity that can be used to store the pieces. It is very similar to one on display in the Visitors' Center in Gettysburg. The biggest difference is that the original has the hinge on the other side so that the cavity is on the same side as the board. However, we haven't found anyone making a duplicate of that board. The board is 8 inches long by 4 inches wide and 1 1/2 inches thick when closed and opens into a square 8 inches on a side and 3/4 inches thick.